Dark secrets and forbidden love threaten the very survival of the Shadowhunters in Cassandra Clare's Queen of Air and Darkness, the final novel in the #1 New York Times and USA TODAY bestselling The Dark Artifices trilogy. 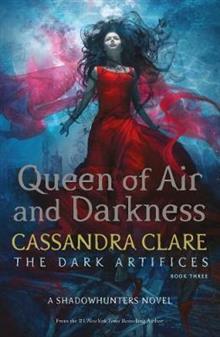 Queen of Air and Darkness is a Shadowhunters novelWhat if damnation is the price of true love? Innocent blood has been spilled on the steps of the Council Hall, the sacred stronghold of the Shadowhunters. In the wake of the tragic death of Livia Blackthorn, the Clave teeters on the brink of civil war. One fragment of the Blackthorn family flees to Los Angeles, seeking to discover the source of the blight that is destroying the race of warlocks. Meanwhile, Julian and Emma take desperate measures to put their forbidden love aside and undertake a perilous mission to Faerie to retrieve the Black Volume of the Dead. What they find in the Courts is a secret that may tear the Shadow World asunder and open a dark path into a future they could never have imagined. Caught in a race against time, Emma and Julian must save the world of Shadowhunters before the deadly power of the parabatai curse destroys them and everyone they love. Cassandra Clare is the #1 New York Times and USA TODAY bestselling author of Lord of Shadows and Lady Midnight, as well as the internationally bestselling Mortal Instruments series and Infernal Devices trilogy. She is the coauthor of The Bane Chronicles with Sarah Rees Brennan and Maureen Johnson and Tales from the Shadowhunter Academy with Sarah Rees Brennan, Maureen Johnson, and Robin Wasserman, as well as The Shadowhunter's Codex, which she cowrote with her husband, Joshua Lewis. Her books have more than 50 million copies in print worldwide and have been translated into more than thirty-five languages, a feature film, and a TV show, Shadowhunters, currently airing on Freeform. Cassandra lives in western Massachusetts. Visit her at CassandraClare.com. Learn more about the world of the Shadowhunters at Shadowhunters.com.